The Fast Metabolism Diet House Party Review!! Last weekend my girlfriends came over and I was lucky enough to be able to give them a copy of the new Random House book (right after the release date!) 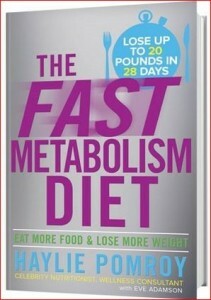 The Fast Metabolism Diet by celebrity nutritionist Haylie Pomroy. We sat around and sipped Peppermint tea from Celestial Seasons and ate several delicious home-cooked meals that I personally cooked in my new Crock-Pot! My friends and I had a Potluck where each individual was responsible for bringing a pre-selected dish so there was plenty of delicious meals to choose from! We even played a fun game as a way to break the ice and get the conversation started. Each guest was to right down the name of the dish that they personally prepared on a small index card then place into a large bowl located in the middle of the kitchen table. I then went around the room and told each guest to pick one card out of the bowl and read it aloud. The purpose of the game is to guess who prepared which dish simply by observing or tasting the food. We had a blast going around and getting to sample each deliciously unique meal then guessing which friend had prepared it, even if we did end up going a lousy 3 for 12. We then gathered in the living room to discuss the new diet book and encourage one another as we began our new quest. Everything is always easier with the support of family or friends, and dieting is no exception. Staying healthy is matter of proper nutrition, exercise, and rest. But nobody said losing weight would be easy, that is why it is absolutely essential that you have a strong support system. It doesn’t matter where you start just as long as you are honest with yourself and create a list of reasonable or realistic goals. “You can’t cross the finish line if you don’t have a clear view of the your starting mark!” Haylie is a firm believer that in order to be successful, it has to fit your life style. The Fast Metabolism Diet is phase-specific meaning it can broken down into three separate parts. These three phases include cardio, strength training, and stretching exercises. After we recorded our individual measurement (size, weight, etc.) ,we broke up into 3 groups of four and began to participate in the three phases. One group would concentrate on cardio by getting their heart rate up either by jumping rope or doing jumping jacks. The second group would concentrate on strength training by completing 25 push ups followed by 5 pull ups then finishing it off with 20-50 sit ups. The third group would focus on stretching or yoga techniques. Each group was to actively participate in each phase for 10-15 minutes before we would alternate then repeat the process. During the 3 different phases (cardio, strength training, stretching) it was very interesting and helpful to hear each friend contribute by recommending or demonstrating what exercises are most effective for them. Sometimes we can grow tired of the same old exercise routine that’s why its important to switch it up and keep the body guessing! Take what you learn from your friends and incorporate into your own routine- make it your own! 2.Blend watermelon cubes in blender with lime juice and peppermint extract. * 2 16-ounce cans chickpeas, drained, reserving 1/3 cup liquid. 1. Using a food processor of blender, blend all ingredients except cucumbers until smooth. 2. Serve each serving of hummus with 1 cup of sliced cucumbers. We had a fabulous time with our healthy, sweet treats. Hailey Pomroy’s book, The Fast Metabolism Diet is available through many retailers online which can be found HERE.